[FOSPOWER IPX7 WATERPROOF BLUETOOTH SPEAKER] FosPower's waterproof Bluetooth speaker is IPX7 rated. This means it can be fully submerged in water for up to 1 meter (3.3 feet) for 30 minutes. Others may offer IPX5, which is only partially water resistant. 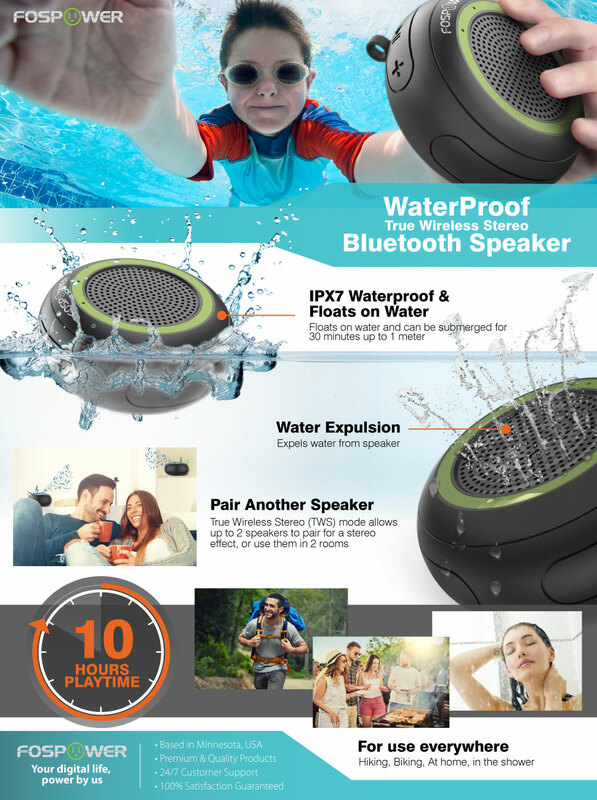 "HOLIDAY GIFTS FOR HIM 2018"
by Consumer Queen Read More "Father’s Day Gift Guide: Must-Have Tech Gifts"
by Parenting In Progress Read More "New FosPower Waterproof Bluetooth Speaker Brings..."
FosPower's IPX7 waterproof Bluetooth speaker is designed to resist up water submersion for up to 1 meter (3.3 feet) for 30 minutes. Other speakers may only offer an IPX5 rating, which means theirs are only partially water resistant. This speaker is also dustproof and built to withstand certain drops. This speaker is able to float on top of water. It also expels water after being submerged, so the audio isn't affected. FosPower's IPX7 waterproof Bluetooth speaker is able to be paired with another identical speaker for true wireless stereo (TWS). Compatible with smart home hubs via Bluetooth functionality. Note: Will not allow for voice commands from user. Expands sound from smart hub only. FosPower takes pride in making sure each speaker is individually hand tested to ensure quality and durability standards are met. This speaker has multi-functional buttons to control volume and song selection. Easily switch songs or increase volume using the buttons on the speaker. FosPower's Bluetooth speaker also has a micro-SD card slot which can play music. Plug a micro-SD card full of music into the speaker and leave your phone behind. Your FosPower product comes with a limited lifetime warranty. Please refer to our website for more information.